note : cMT-FHD can be connected to a HDMI TV or screen, possibily with touch functionnality such as cMT-iM21 (consult us for complete list of supported touch screens). cMT-SVR-100, cMT-SVR-102,cMT-SVR-200,cMT-SVR-202 are pure data server stations and cannot have screens. Display is only possible on HMI clients. 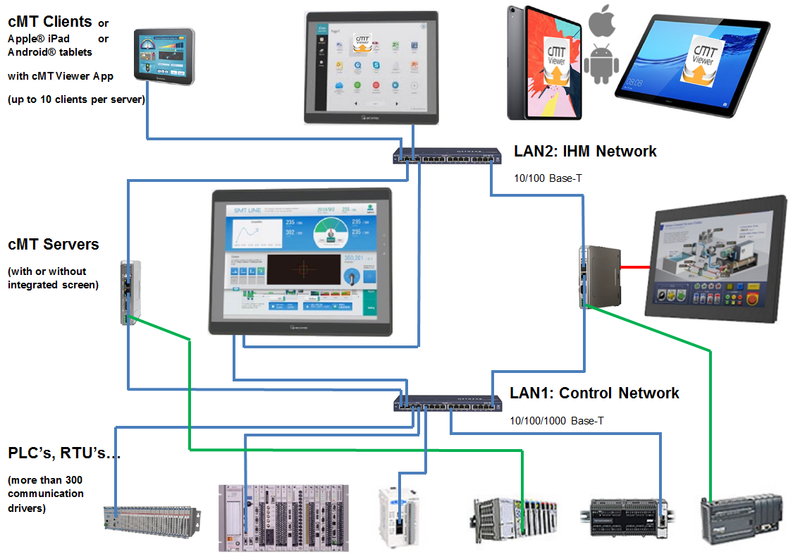 HMI clients run the cMT-Viewer application on iPad, Android tablet device, Windows panel PC or cMT-iV5 HMI. The cMT-Viewer application includes user friendly HMI functionalities. You can quickly navigate through graphic pages to monitor different machines. Additionally, cMT-Viewer is perfectly integrated within the cMT-iV5 tactile screen and tablet devices, making them as easy to use as smartphones.